Being audited by the IRS is one of the most terrifying experiences that many people can think of having. When you’re sitting across from that IRS auditor, the situation can seem even more intimidating. You may feel nervous, a little afraid, and maybe even a little angry all at once. You want to cooperate, but you also want to protect yourself so that you don’t make any mistakes and face any penalties. Whether you are talking to the auditor on the phone or in person, you have the right to be treated with respect. The auditor should not be rude or unprofessional, which can include making obscene comments or gestures or making threats. If you feel that you are being treated poorly, you can report the behavior to the IRS or to a lawyer. The same is true of written correspondence. Your auditor cannot write any nasty or threatening comments, either. No one wants to air their dirty laundry, and financial issues can be especially embarrassing for many people. Most people don’t want their friends, family members, or co-workers to have even the suspicion that they have a “problem” with the IRS — even if the audit doesn’t actually turn up any issues. The IRS recognizes the importance of privacy, and auditors are ordered to maintain your confidentiality. They should not talk to anyone about your case who you do not authorize them to talk to or who does not need to be questioned about the specific issues in your audit. Your auditor can’t keep you guessing about why you are being audited or what information the IRS needs. You have the right to know why the IRS is asking you for information, what it will use that information for, and what the penalties will be if you do not comply. Your auditor should freely provide this information during your interactions and should answer all your questions freely. This may seem like a no-brainer, but some people may feel so intimidated by the audit process that they do not realize that they are being extorted. They may think that the auditor is collecting a penalty or interest. This is one of the many reasons why you should work with an IRS lawyer during your audit. Your attorney will let you know what your rights and responsibilities are, so that you can recognize illegal activity when it occurs. Don’t feel tempted to slip the auditor a little something to make the problem go away, either. All you’ll be doing is creating more problems for yourself by adding criminal charges to the list. If you have knowingly included incorrect information on your tax return or omitted necessary information, the auditor is legally required to report it. As stated above, you shouldn’t attempt to bribe the auditor with money or gifts. You should also not try to talk your way out of the situation. If an auditor knowingly conceals fraud, you may both face legal charges. It is important that you always work with an experienced tax audit lawyer during the audit process. Your IRS lawyer can help you understand your legal options if you are found guilty of wrongdoing and can help you learn about your financial options if you are found to owe money. 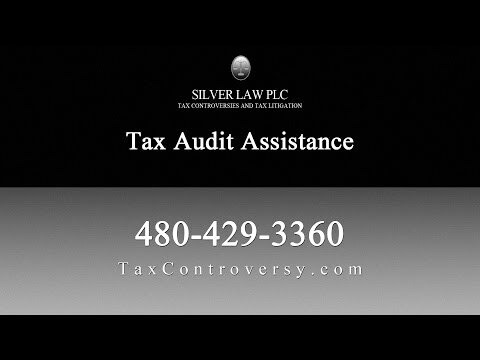 The attorneys at Silver Law PLC represent individual and corporate clients in tax audits in Phoenix Arizona, as well as other tax matters, such as civil and criminal tax litigation, collections, and offshore reporting requirements. Our Phoenix tax attorneys help clients while they are going through audits, as well as help them resolve issues uncovered after an audit. Call us today to learn how we can help you.